The Chinese language learning technology space in my opinion is still under utilized. There are so much more avenues to explore in terms of aiding informal and formal learners of Chinese. There has been quite a lot of advances recently with excellent products (3000Hanzi and ChineseLevel) as well as great tools (HanziJS and Leiden Weibo Corpus) among others in the web space. The mobile space is very much an exploratory scene at the moment. There are apps such Tencent’s Intelligent Eye and Pleco’s Optical Character Recognition, not even mentioning the awesome dictionary apps, of which Hanping is my favourite on Android. Mandarin Madness is a relatively new app on the scene that aims to make learning Chinese vocabulary easy and fun at the same time. I downloaded it and tested it out for a review on my HTC Desire Android phone. First I’ll just give an overview of the app, then I’ll leave my thoughts. The art and sound design is consistent and inviting. This often one my biggest gripes when it comes to learning applications in that the creators/developers often overlook the whole package of creating instructional programs. Art and design is definitely something that aids a learner in interacting with the program (or at least not chasing them away!). The pictures are solid and often cutesy, but not in the way that it will put off the alpha-male-Hello-Kitty-hating jock. The sound, although not perfect, serves its function. The app has several vocabulary lists, ranging from animals, to colours, to stationery, to clothes and more. Usually about 10-12 different words surrounding a theme. As seen in the screenshot, words come down from the top and you have to choose the correct corresponding picture/icon below before it reaches the bottom, otherwise you lose a life. They “train” the vocabulary association by starting only with one character (along with pronunciation which is sounded out as it starts dropping) and one picture. In doing so you know that 狗 is pronounced gǒu and is linked to a dog. After each vocabulary item is correctly associated, the level ends. They then add more pictures below (four is the max), from then on levels either become quicker, or they remove either the sound or character, so you can learn both associations. It keeps on speeding up until it reaches level 15. The next stage is a where the words sort of bounce around in random directions. It does not go straight down like the first stage. Sometimes the characters even turn upside down. The final stage is where you have to arrange the icons at the bottom to correspond to four characters coming down from the top before they reach the bottom. Mandarin Madness is language agnostic. This means that the app is meant to be used by anyone, regardless of native tongue. This means, for someone like me, there’s no English anywhere in this app. Associations between sound + character to meaning is mapped by the picture that it provides. Thus, it’s a “natural” approach to word acquisition. This is not necessarily the better approach, as it depends on the kind of learner. Furthermore, there is little explicit instruction in the app concerning grammar, word structure or any such sorts and thus mainly focuses on vocabulary acquisition. I find idea of a language agnostic app quite interesting and actually really cool, but it comes with its disadvantages. It’s really hard to help with meaning negotiation when it comes to learning words. You have to rely on the pictures to explain what the word means. This is really tough and perhaps one of the app’s biggest challenges. Some words work quite easily, like numbers, colors or animals. Objects that are easily defined by a picture. However, other words, such as Peking Duck, Spring Festival Couplets and Lion Dance (舞狮) in the Chinese culture vocabulary group are hard to understand completely. I have some previous knowledge of Chinese, thus I knew what they meant, but without that, how does one know? Abstract words will be out of the scope for this app. An uniquely Chinese challenge comes up too. There are other versions of this game for Spanish and English. They work fine, but for Chinese, due to it having no grapheme-to-phoneme correspondence, ie. it doesn’t use an alphabet, its harder to understand the pronunciation of Chinese without an idea of how the romanization looks like. Pinyin (or Zhuyin) serves a function to mediate learning the actual pronunciation, without it, you’re kind of lost, unless you already know it to some extent. New learners would have trouble understanding Chinese pronunciation. There are also no indication of tones, or even the existence of them! Many incorrect inferences will be made by unsuspecting learners. 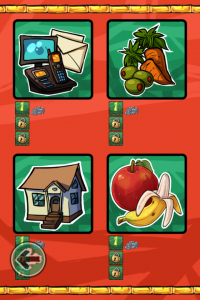 Due to it being a touch screen app, pressing the icons to select the character is quite easy and fits the style of learning. However, there are some other things in the app that bugs me. Some things that would put me off from using the app completely. One of these is the fact that during a stage, with its increasing difficulty in levels, there is no way to “save” a level once you’ve passed one, besides actually losing all your lives. If I want to stop the game and not redo all the previous levels, I have to literally make myself lose. Just wait for the words to scroll past my screen. Maybe this is an oversight, but it really hampers the flow and accessibility of the app. Due this, the app feels unnecessarily repetitive and chore-like. I can’t just quickly play a level while waiting in a queue. Also, when you choose a wrong word, red crosses cover all the words for a brief second or two. During the higher levels, when the words move down quickly, you can’t press the “crossed” out buttons, until the red cross fades away. This makes it almost impossible to correct a mistake at such a high speed and you inevitably lose a life. Other factors are due to the language agnostic approach to the app. There are no instructions. Nowhere. This makes it very hard for the user to understand what is going on and what buttons mean. This is where clever user experience design can overcome this hurdle, but it doesn’t quite make it, especially on the last stage, where you have align icons to the words that are dropping down. It took me at least 4 deaths to understand what’s going on. Maybe I missed this point, but for some reason you get points. There is no indication for what these points are there for, besides just for show. 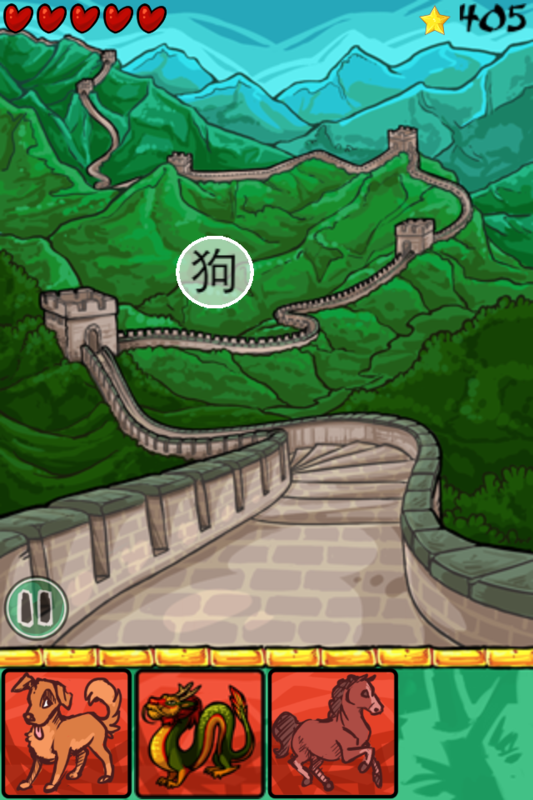 Mandarin Madness has definitely some interesting ideas, like the agnostic approach, vocabulary sets and arcade-like gameplay, ones which I feel can be quite beneficial in making a fun interactive learning game on your phone. For now, there are some serious challenges in the usage of the app and some hurdles that need to be jumped before I will recommend this app as a permanent addition to a Chinese learner’s, especially beginner learner’s smartphone. Some of these hurdles are the disadvantages of a language agnostic approach, user experience hiccups and not addressing the unique properties of Chinese vocabulary.